“The way Nazis treated the ‘pink triangles’ is unspeakable,” Brazda told Têtu, referring to the emblem gays were forced to wear to signify their homosexuality. “They had absolutely no mercy. 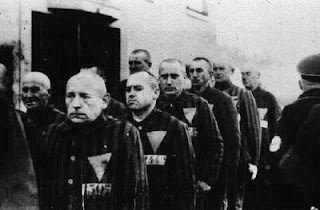 The “pink triangles” not only had to suffer the ill treatments of the Nazis but also had to endure the homophobia of other prisoners. In the documentary Paragraph 175, which takes its name from the German Criminal Code provision regarding homosexuality, Pierre Seel, the only Frenchman to have publicly testified about his imprisonment for being gay, explains that "the weakest people in the camps were the homosexuals; they were at the very bottom.” Seel died in 2005. The cycle of history repeating itself is crazy. And also the ignorance of people in general. For example, gay being a choice. When you're in a situation where you're killed for being gay, how do you rationalize it being a choice? Survival is a basic instinct.